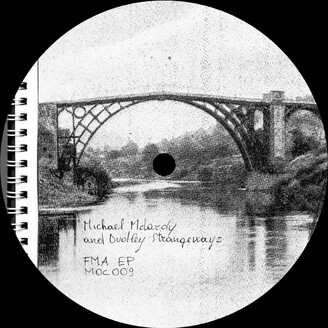 After his release on MOC last year, Dudley Strangeways joins forces with Michael McLardy for their first joint EP on the label. Well known as the heads behind Leftback Records and frequent collaborators, they each contribute two original tracks in sheer concrete style. Michael McLardy opens proceedings with “Separation”, a minimalist techno exploration that slowly builds up by the way of mechanical rolls and undulating synths. Kicking off with a playground noise sample, the bit fades away after the breakdown and is replaced with dark eerie guttural cuts, enhancing the overall gravity of the track. “Another time” plays upon the same ambiental background sample, giving the piece a sense of familiarity. The build up, however, is loosely strung with ascending airy synths, while metallic percussion pads keep the groove grounded. McLardy manages to create an infinite sense of spaciousness that’s cut off to an abrupt end, predicted only by a faint and hollow percussion lead. Dudley Strangeways’ first offering, “Cast” is a moody slice of ambiental tech, with a slow pace aptly accentuated with piercing shrills and clangs. “Hydra” takes us into the deep end of dark techno straight from the get-go with its pounding bassline. Crafted by layering minimalist yet memorable arrangement patterns, space is once again key. A classic piano lead makes its appearance halfway, giving the track an entirely new dimension and prolonging, yet never releasing the pent up pressure.